Flossing, an eight letter word that manages to make most people cringe and wince at the very thought of what the word implies. There may well have been reports that flossing makes no difference and is not effective (BBC 2016), but these reports have misinterpreted the findings and comments of the European Federation of Periodontology. Failing to effectively clean, plaque, bacteria and food debris from in between the teeth can lead to gingivitis, otherwise known as gum disease. Over time, if the teeth and gums are not properly cleaned, the plaque is not removed. The plaque builds up and the bacteria in it produce acids which irritates your gums. This can lead to redness with bleeding, swelling and tenderness. This is the early stages of a condition called gingivitis, or as it might more commonly known, gum disease. A necessary evil, interdental cleaning takes time, it can be awkward and it can be painful for many. As many of us rather not complete the task, many of us do a poor job of it. But I am sure you would rather not have bleeding gums, nor put yourself at a greater risk of diabetes or a stroke, so investing your time in a good interdental clean is the answer. Thankfully there are some excellent tools that make flossing easier and more bearable, but most importantly contributes to better oral health. See some of our quick picks in the table below, or keep reading for a more detailed look at each one. They are more expensive, but most people find them considerably more convenient and much easier to use than dental floss. Interdental brushes come in various different sizes and styles; but the fundamental principle behind them is that they reach deep between the teeth and use bristles to sweep away plaque and bacteria from the sides of the teeth and the gum surfaces. You need to find the right sized interdental brushes for you. You may need several different sized brushes to suitably fit the different gaps in your mouth. Once you know what you need, you are all good to go. It is just as time consuming as regular string floss and will likely work out a little more expensive, but normally the process is a lot less awkward and easier once you have the right brush selected. This added convenience and thorough cleaning will pay dividends. Swedish firm TePe are one of the market leaders — we rate their products as the best interdental brushes. Their original range comes in 9 different sizes, but there is an extra soft range available in 6 sizes and an angle range which may be more useful for reaching back teeth. 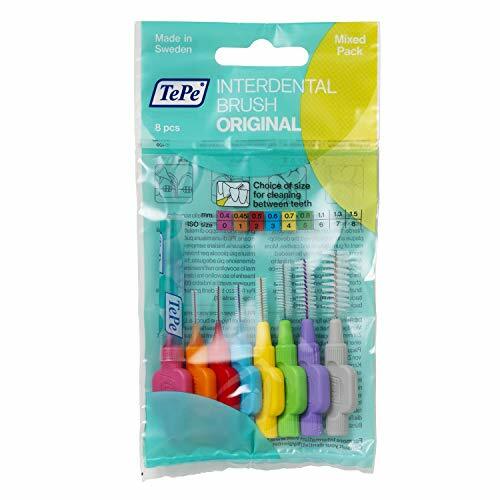 If you want to get going quickly, check out this original multipack available to buy on Amazon, which includes a variety of interdental brushes. We have put together a guide for all you need to know about interdental brushes, which explores these in more depth, if you would like to know more. We have all had that satisfying feeling of getting that bit of food out from between our teeth, just imagine the consequences or feeling if you did not remove it. Flossing is the act of cleaning between the teeth using a type tape or string known as floss. The problem with regular floss is that is is more awkward as it involves inserting the bit of floss in between the teeth using our hands and it can be a fight to position your hands, the floss and see what you are doing let alone making sure you have the right technique. Floss now comes in varying thicknesses with wider ‘tape’ floss available. This is more comfortable for some as it has a larger surface area and does not feel like it cuts in quite the same way. 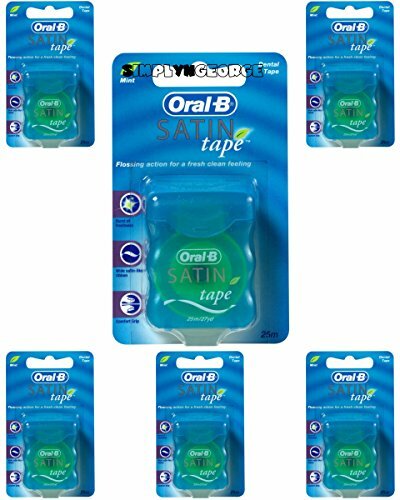 One of our favourites, is Oral-B’s Satin Floss Tape. It is certainly not the cheapest but lovely to use. You can buy it on Amazon here. However even a better grade floss is not all great. Where floss really wins is getting into the very tightest of gaps. There are some modern solutions. 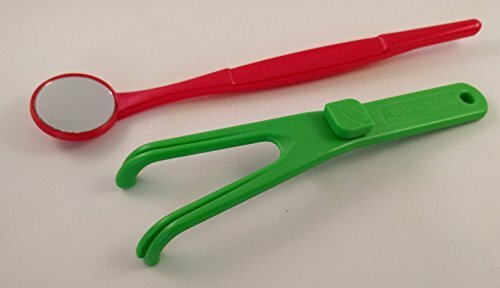 These take a piece of floss and fix it firmly between two plastic arms so you have to hold onto the flosser rather than the floss itself. We go into further detail in our best dental floss article. 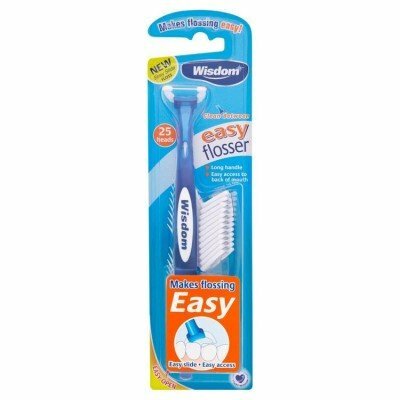 Our favourite, the Wisdom Flosser is much like a toothbrush with a long handle, but rather than a brush head it has a floss head. The long handle makes it easy to reach into the mouth, even right at the back and move the flosser around. You can do it one handed. The design of the head means you can also bite on the plastic to help the floss on its way. You change the floss head each time it has been used, and throw this away. Replace the head and you are ready for the next flossing session. Each flosser comes with a handle and 25 replacement floss heads in the pack. You can buy the Wisdom Flosser from Amazon or on Wisdom’s own website. 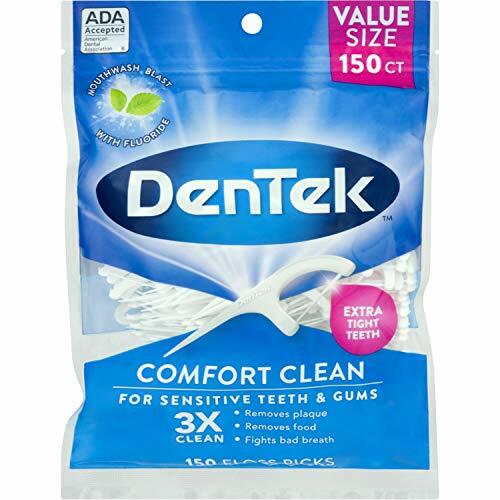 Available from many different brands, our favourite have to be the DenTek Comfort Clean Floss Picks. A good value option these most certainly are a use it and throw it away design. The floss is strong enough to survive a flossing session, but the plastic construction is much thinner and cheaper than the likes of the Wisdom Flosser. The floss head is at one end and at the other is a plastic pick, for helping get larger food debris out from the teeth and mouth. These can be purchased on Amazon. With 150 in the pack, it should last you a couple of months at least. Whilst these glorified floss solutions make the process easier, there is an overriding environmental concern. Such products with a one time or limited life do not help the problem of plastic waste that plights the world we live in today. Now the problem is much much bigger than a few flossers, but plastic waste is an issue that should not be ignored. They cost just a few pounds and can last many years. 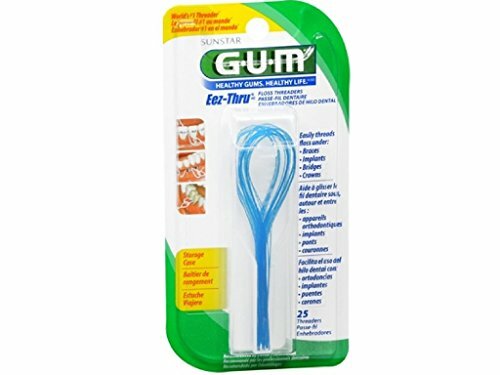 A popular thread flosser is that manufactured by GUM. 25 are included in the pack and is the recommendation of many dentists. 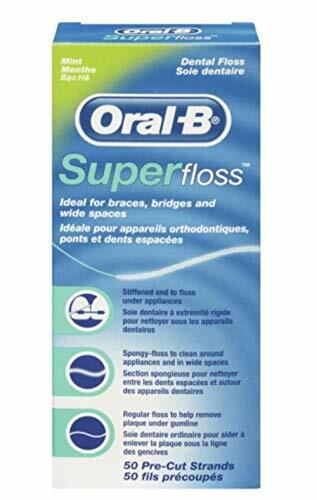 Another option is the Oral-B Super floss. It is floss with a threader built in. Pre-cut and ready to go it is extremely convenient and particularly popular with those who wear braces. Sadly no longer available, Waterpiks Power Flosser is the best example of such a product today. Such tools are particularly appealing to those who have trouble using regular floss but want to pay attention to their interdental spaces. Dare I suggest this is for the lazy flosser?! Whilst these can be purchased relatively cheaply, a decent water flosser will set you back a fair chunk of money. However, their ease is unrivalled in my opinion. Essentially a water flosser provides a jet of water into the mouth to use force and motion of the liquid (sometimes combined with air) to remove the harmful plaque and bacteria. Waterpik have the largest range of water flossers and are perhaps best known with products that offer the most versatility. The downside to these products is that due to their on board water tanks, they tend to be bulkier. There are the corded flossers that require constant power and there are the cordless options, better suited to the likes of travellers. Why not check out our recommendations for the best electric water flosser to find out more. 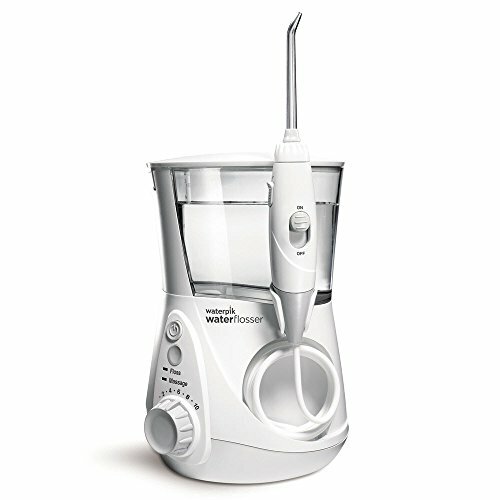 For those with the space Waterpik’s Ultra Professional Water Flosser offers the best all round value and performance. For a start the much larger water tank means that you do not necessarily need to refill as often as you do with the handheld options. You have more control over the power of the water jet and nozzle position as well as having different nozzles available. For those with braces, a Water Flosser like this is excellent as you can direct powerful streams of water into the hardest to reach places. There are arguments for and against all of these different products. Some will argue floss is best, whilst others will argue water flossers are nonsense. It could be argued this is not a true water flosser, but in my mind the one of the best flossers as it makes flossing effortless. Using a combination of air and water a high pressure jet is sent in between the teeth and gums to clean out the plaque. Handheld and cordless, there is a built in water tank and a good battery life to this unit. Simple and easy to use, it is lightweight and well constructed and you can floss your whole mouth in just 30 seconds! If you really don’t want to floss, but know you should and you want the least hassle, this is it! You can view and buy it on Amazon. 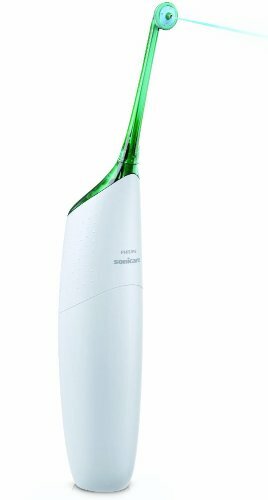 Waterpik do have their own equivalent, the Cordless Plus WP-450 or 350 (view on Amazon) which technically are better for your oral health, but Sonicare has the edge here when considering convenience. However both have small tanks and less control than a worktop seated flosser. There are and always will be differing points of views and studies that reveal one thing or another. The options we present will not be suitable for all, we have preferences. What is consistent though is that any effort to carry out interdental cleaning is better than making no effort at all. Those that do clean in between their teeth be that with fancy interdental brushes or with good old fashioned floss are at a lower risk of gum disease than those who take no action.